Machining or valve leaflets without a gasket. The valve is cut in the shape of the two parts (valve and bottom valve) may be one-piece with the bottom valve. The upper part of the valve cut out is wider than the lower valve 0.2-0.3 cm along the side and bottom sides. Details fold, right sides inside, equalizing sections, and smatyvay from the valve Posiva it in the corners. Grind from the bottom flap seam with the width of 0,5-0,7 see the Seams in the corners are cut, leaving a seam allowance of 0.2-0.3 see the Valves turn on the front side, spawn and priorivet.If any model is on the edge of the valve from the front side lay the finishing line. If the valve is cut along with the bottom valve, then bend it in half, stack the ends and grind on the sides, corners trimmed. Then turn the valve on the front side, the edges straightened, and spawn priorivet. The inner edge of the finishing of the valve is overcast. On the flap with the inside plan a line for primaqiune to the primary. Finishing valve pritachivajut to the product so that the line marking on the product and on the lining match. The inner edge of the valve can be stitched a second line, located 0.2-0.3 cm from its edge (Fig. 487). The leaf is treated similarly to a valve. Processed the leaves pritachivajut to the product as well as a flap, then folded in the side seam and pritachivajut to the product on the sides (Fig.488). Treatment Welt pockets without valve with straight cut. The location of the pocket space on the front side of two transverse lines defining the length of the pocket and one longitudinal defining the direction of the pocket. Then outline the two auxiliary lines (above and below the intended average) at a distance equal to twice the width of each of the edging or frame (Fig. 489 a). 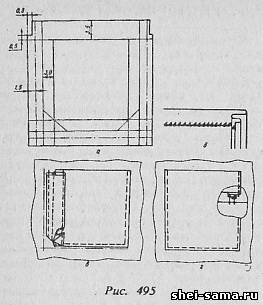 To handle such a pocket cut out two piping from the core material or finishing cloth - one part sack of the main material (may be in two parts), one dolevik (if necessary).The facing of the upper edge of the pocket along the bend in the middle and folded wrong side inside, and the bottom piping bend one equity edge towards the inside about 1-1,5 cm and iron the folds. Piping is applied to the main part bends towards the auxiliary lines and the cuts in the direction of the cut of the pocket and primetyvajut so that their ends go beyond the lines defining the pocket size 1.5-2 cm on each side. Piping pritachivajut at a distance of 0.3-0.5 cm from the bend of obcutek depending on the model (Fig. 489 b, C). The ends of the lines must end strictly at transverse lines determine the size of the pockets. The fabric between the lines cut in the middle from the inside, beginning from the middle of the pocket on both sides (Fig. 489 g). Not reaching the ends of the pocket 1-1. 5 cm, make the cuts slanted towards the ends of lines, ending them at a distance of 0.1-0.15 cm from the ends of the lines.Through the resulting hole obtachki inside out, the edges straightened, tighten the ends so that the edges of the piping connected back to back, and fix ends of pocket from the inside back of machine stitching at the base of the corners. If the Hessian consists of two parts, one part of the burlap should be shorter than the other 4-5 cm Smaller part of the burlap pritachivajut to the lower facing. Joint width 1 cm seam folded in the direction of the burlap. A large part of the burlap pritachivajut to the upper facing, laying the line from the inside seam of primaqiune piping (the core part thus bent). Weld width of 1-1,5 see the seams of the burlap primaqiune to obtachku overcast. 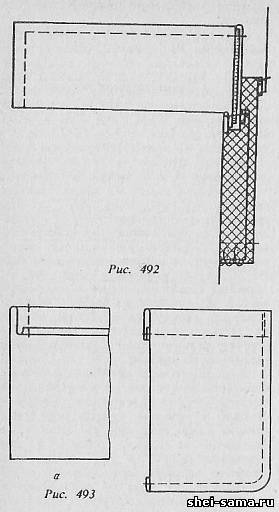 Burlap pockets sew three sides with a seam width of 1-1,5 cm, clipping the corners of the pocket (Fig.490). In products from tissues, stretch easily, the pocket is made with dolevikom. Dolevik enclose the inner side of a main part and pritachivajut at the time of pritachivajut obrazek. Treatment Welt pocket without flap with snap closure elastic zipper. Primaqiune of obrazek and burlap, cutting parts, viverravidae of obcutek on the underside of the part and the securing ends of the pocket produced in the same way as in Welt pocket without flap with a straight cut. Under piping from the inside of the product enclose the braid-lightning to the middle of the tape coincided with the middle of the treated grub. The braid-lightning scribbled on the front side of the product, positioning the stitching on the seam primaqiune of obrazek. Treatment Welt pockets with leaflets. The finished leaf outline line primaqiune it to the primary (treatment of leaves as described earlier). On the main details outline the location of the pocket three lines one equity, which determines the direction of the pocket, and the line of primaqiune leaves, and two transverse lines that define the size of the pocket.In products from tissues, easily stretching from the inside line to the pocket primetyvajut dolevik two shared lines so that a large part of its width was located to the side of the leaves (ready for use) and only 1.0 cm in width below the seam primaqiune leaves. The leaf is applied on the front side of the product for the intended line cuts the line of the cut of the pocket (Fig. 491 a). On the burlap leaf is applied wrong side up, stack the slices, leaves and burlap, primetyvajut and pritachivajut both the burlap and the leaf.The second part of the burlap is applied to the product is cut to the line of the cut of the pocket face down and pritachivajut parallel to the line of primaqiune leaves a seam width of 0.8-1 cm (Fig. 491 b). The main part between the lines with the back cut, starting from the middle and not reaching 1-1. 5 cm to the ends of the lines make inclined cuts and finish them at a distance of 0.1-0.15 cm from the ends of the lines. Turn the burlap inside out of the product. Seam primaqiune leaves spawn, the ends of the pocket from the inside is fixed a double reverse stitching at the same time grinding off the burlap seam with a width of 1 cm sections of the burlap and the seams of her primaqiune to the product overcast (Fig. 492), the Ends of the leaves primetyvajut to the primary and depending on the model scribbled on a machine or manually sew hidden stitches. Treatment of smooth patch pockets. The top edge of the pocket can be processed by the welts, trims, obrazkami or seam bodybu. Patch pockets cut out with allowance for ACC on lateral and lower sides of the width equal to the distance from the edge of the pocket to the finishing line of felling it at the main part plus 1-1,5 cm Slice of allowance for ACC upper edge of the pocket in the articles of wool and silk fabrics bend towards the inside of 0.5-0.7 cm and zastrugivajut at a distance of 0.1-0.2 cm from the bent edge.For products made of cotton fabrics allowance for ACC upper edge of the pocket along the bend line on the front side. Cut 0.5-0.7 cm bent in the direction of the stock and grind the corners on the amount of the allowance (Fig. 493). Joint width should equal the width of the seam allowance on the sides of the pocket. Allowances of seams to the intended line of cut, leaving 0.5-0.7 cm, turn the corners on the front side, straighten; in the products of cotton fabrics bent section zastrugivajut at a distance of 0.1-0.2 cm from the edge.The top edge of the pocket priorivet simultaneously iron the edge of the pocket along the side and bottom sides. The pocket is applied to the basic detail on the intended lines and scribbled (Fig. 493 b). The top corners of the pockets secured a double reverse stitching. Pocketing of the main parts of the product. On the front side of the top part of the facing is applied, cut along with one piece of burlap (Fig. 494 a), facedown and metiaut, equating sections (Fig. 494 b) grind the seam width of 0.5-0.7 see the Seams in the corners are cut, leaving a seam allowance of 0.2-0.3 cm, and obtuse angles and rounded netscout. The facing folded to the side of the inside details, angles and joints straighten, spawn, forming, edging to the side of the piping with a width of 0.1 cm At the corners of the pockets lay the finishing line on the front side at a distance prescribed by the model. Machined top detail is applied to the bottom, cut along with part of the burlap (Fig. 494), equalizing the processed edge from the intended line, and fasten to the sides, machine stitch length of 2-3 cm starting from the top of the pocket. After that, the upper part bent and grind off part of the burlap on the bottom edge seam with the width of 1-1,5 seeThe seam is overcast. The sides of the burlap have to enter the connection joints of the main parts can be Stacey and separately from the main parts. If the end of the pocket is included in a pleat or tuck, then the burlap should not be included in the joint connection details. In this case, after processing the upper edge of the core part is applied to the bottom on the planned line and by tilting the primary part on the front side, connect the upper part with the lower line of stitching around the top edge on the area 2-3 cm from both edges, and then sew the burlap on three sides.The main detail of the bend on the front side, fold the bottom, right sides inwards and sew, ending a line below the upper edge of the pocket pleat or tuck (Fig. 494 g). Processing surface of the pocket of three-dimensional form. On the main part of the product plan a pocket"wallet" in finished form, and then do two allowance on sides and bottom. The first allowance is 2-3 cm, to create a three-dimensional form, the second is 1.5 cm, for processing of the seam. On the upper side of the pocket make seam allowance, equal to 3-3,5 cm then cut out the pocket. The upper corners cut by 0.2-0.3 cm from the vertical line of the seam allowance towards the bottom of the pocket, short of 0.5 cm to the line of bending of the allowance for processing the upper edge (Fig. 495 a).In products from tissues, stretch easily, bend the top edge of the pocket from the seam allowance edge, or lay the strip of cushioning material to protect the edge of the pocket from stretching. Cut the stock bend on the wrong side of the pocket and scribbled or left free for later fixing his button, if required by the model (Fig. 495 6). At the lower and lateral sections of the allowance for processing pocket iron of 0.5-0.7 cm on the wrong side, sautieva also stock to create bulk. The bottom corners of the pocket are folded at an angle of 45 and grind. The fabric in the bottom corners of the pocket cut out, leaving a seam allowance of 0.3-0.5 cm, and rautureau. Depending on the model of the pocket scribbled finishing line press parallel to the edges. For connection of the pocket with the main item on her scheduled two lines: the first defines the location of the pocket in the second for felling pocket.This line includes inside first and it is determined by the size of the pocket in finished form minus the allowance for volume and plus seam allowance, equal to 0.8-1 cm Pocket ready to put on the main part at the first scheduled line. On the second line is applied press the seam allowance of 0.5-0.7 cm on the processing of the seam, primetyvajut and scribbled at a distance of 0.1-0.2 cm from the bent edges at the same time nastraivat bent ends of allowances for the seams, grinding of the bottom corners of the pocket. The second line scribbled on the line of the allowance for processing of the weld (Fig. 495 C, d). Handling internal pocket in side seam. In skirts is zipper in the side seam can be processed inside pocket (Fig. 496). In this case, the burlap cut out of a fabric top. The top edge of the burlap is included in the splice seam skirt with belt. The width of the top edge of the burlap 4-6 see Burlap pritachivajut to the side seam of the skirt, and then grind, not reaching 6-8 cm to the top of the burlap. Neobychnye areas of the burlap must be pre-serged. Seam primaqiune burlap to the front panel of the skirt can be stitched. Similarly processed inside pocket in the side seam of pants.